We are located in Woodland Park, Colorado, nestled in the beautiful Rocky Mountains with a Pikes Peak view. 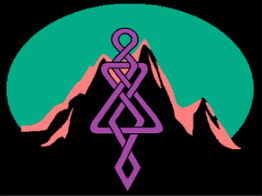 Mountain Eire serves Teller and Western El Paso counties, bringing traditional Irish dance instruction and performance to our rural area above 8,000 feet in elevation. We are members of An Coimisiun le Rinci Gaelacha (the Irish Dance Commission in Ireland), Irish Dance Teachers Association of North America, and the Western Region. Be sure to like and follow us on facebook.com/mountaineire!! 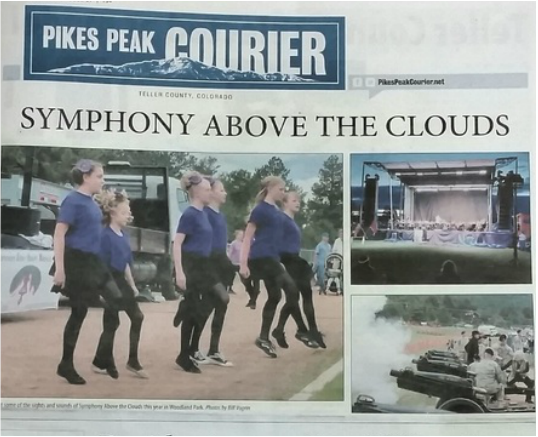 Mountain Eire helps open for the Colorado Springs Philharmonic concert July 5th, 2015 and 2016, AND we made the front page of the newspaper!! June 17, 2014 Mountain Eire Sets New World Record! To celebrate our one-year anniversary, we continued our budding tradition of having an adventurous spirit. 21 of our dancers, ages ranging from 8 to 61, drove to the summit of Pikes Peak, 14,110 feet in elevation, and set a new world record for "HIGHEST ALTITUDE TRADITIONAL IRISH JIG." We had so much fun, and KRDO News came out and filmed us! The extreme altitude was not as hard on us as we had predicted, and everyone did a great job! A HUGE thanks goes out to our fabulous road crew, made up of parents and family members, who hauled boards, car-pooled all of our dancers, set up our stage area, ran the music, video-taped and took photos, and packed up all of our gear afterward! We couldn't do it without you all! You can see the video of our dance at the summit on www.recordsetters.com, or look for the link on our facebook page. See our photo album for more pictures from this awesome event! 3) Either download and print off the registration sheet at this link, or wait and pick one up at your first class.